This documentary garnered critical acclaim and reviews that referred to it as “An unflinching, nonjudgmental chronicle” (Wired), “Inspires then and now connections, fulfilling any historical work’s highest calling” (S.F. Examiner), “Truly greater than the sum of its parts” (N.Y. Post) — at a time when interactive documentaries and musical experiences were new to the digital media. 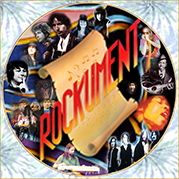 The following 3-part rockumentary is an excerpt from this CD-ROM (now out of print). See Credits for video credits.